First-year state Rep. Lisa Callan came to Olympia with a computer engineering background, a burning desire to help Washington kids thrive and learn, and a commitment to erase state route 18's well-deserved reputation as a traffic nightmare. You'll meet her today. As a Boeing engineer, Lisa Callan helped create the best airplanes in the world. Now that she's a member of the majority Democratic Caucus in the Washington state House of Representatives, she's putting her creative skills to use to help build a better Washington. In this edition of Capitol Ideas, she talks about being a brand-new lawmaker, fixing a nototious traffic chokepoint in her district, giving Washington kids the best schools around, and more. Give her 16 minutes; you'll be glad you did. Washington state Rep. Jeff Morris is one of the Legislature's top thinkers in the field of energy, and today we'll talk about how smart, efficient appliances are going to change our lives. For Rep. Jeff Morris, the future can't get here soon enough. Today we'll talk about energy -- how we get it, how we waste it, where the industry is heading and how his legislation that gives a thumbs-down to inefficient appliances is a first step to saving money, and lots of it. Plus, you'll learn what vampire power is. That's a bonus. Opioids: The life and death of a young man, and a plan to fix Ricky's Law in the Legislature. This special edition of Capitol Ideas focuses on the opioid epidemic and features two interviews: One with Debra Maher, whose son, Sean, died of a heroin overdose last year despite his eligibility to be involuntary committed to treatment under the terms of Ricky's Law, and the second with Rep. Lauren Davis, who helped create Ricky's Law before her election to the Legislature in 2018, and who is now sponsoring legislation to address the situation that allowed Sean to fall through the cracks, despite the fact that his was precisely the kind of case that Ricky's Law was designed to deal with. Freshman lawmaker Amy Walen comes to House of Representatives in Olympia fresh off a stint as mayor of Kirkland, and she brought with her the can-do, let's-fix-that attitude that characterizes good local government. Today on Capitol Ideas she'll talk about what she plans to do and how she plans to fix what needs fixing. Rep. Amy Walen is the 48th-district's newest legislator, but she knows her way around government. She's a former Kirkland city councilmember, and before her swearing in as a Democratic state representative she was mayor of that thriving King County city on the eastern shore of Lake Washington. She's CEO of a car dealership, practiced law in Australia, cares about housing and transportation and the environment and firearm violence, and if you give us 13 minutes today, you'll be glad you got to know her. Deputy House Majority Leader Larry Springer is a business owner himself, and a few years ago created the House Democratic Caucus Business Roundtable. It's become an important part of how lawmakers vet prospective new laws, and we'll talk about it today. Rep. Larry Springer works for the people of the 45th legislative district, a King County district that comprises Duvall and Woodinville, and parts of Kirkland, Redmond, and Sammamish. He’s deputy majority leader of the House of Representatives, has been a member of that body since 2005, and for more than 30 years he’s owned and operated a retail wine store in Kirkland. That last fact is key to today's conversation. Give it a listen. House Majority Leader Pat Sullivan has a solution to the student loan crisis that is dooming today's college students to a lifetime of debt. House Majority Leader Pat Sullivan (D-Covington) was instrumental in solving the state's shortfall in basic-education funding, and now he's turned his attention to higher ed. In the 2019 session he's the force behind the Washington Student Loan Program, a low-cost, state-funded, self-sustaining program that could save generations of students from being indentured to high-interest creditors for much of their adult lives. Rep. Dave Paul is a college vice president, a husband, a dad, an environmentalist, and an idealist: All good things for a newly minted representative from one of Washington's most beautiful districts, the 10th. You can get to know him better right here. 10th-district state Rep. Dave Paul showed up in Olympia with a long list of goals, and it's likely he'll accomplish a lot of them. In this brief conversation he touches on higher education, naturally, but also veterans' issues, tourism, the economy, the environment, electric cars and ferries, and more. When My-Linh Thai took the oath of office in Olympia a couple of weeks ago, she became Rep. My-Linh Thai -- the first refugee to serve in the Washington state Legislature. It that piques your interest, give a listen. Rep. My-Linh Thai is a lot of things: a pharmacist, a successful businesswoman, a former member of the Bellevue school board . . . and, incidentally, a refugee who fled Vietnam with her family at age 15 and found a home in the U.S. She's the first refugee to be elected to the Washington state Legislature since statehood -- in other words, ever -- and she's got a story to tell. Before Lauren Davis became the new state representative from the 32nd district in King/Snohomish counties, she was almost single-handledly responsible for the passage of Ricky's Law, a life-saving change in the way Washington deals with victims of substance-abuse disorder, alcoholism, and behavioral illness. Listen to her story. In this installment of "Capitol Ideas" we meet Rep. Lauren Davis, midway through her second week as a state representative. With a resume that begins with Head Start teacher and goes on to include international development work in West Africa, advanced studies in Ghana as a Fulbright fellow, several non-profit startups and a stint with the Bill and Melinda Gates Foundation, it's hard to accept that she is one of the youngest members of the Washington state Legislature. For all that, her most personal and crucial work has involved helping people recover from alcoholism and drug addiction, and that's mostly what we talk about today. This is one you don't want to miss. Rep. Debra Lekanoff is the first Native American woman elected to serve in the Washington state House of Representatives since the state's establishment 130 years ago. Today we'll find out who she is, and why we're lucky to have her. Today's "Capitol Ideas" is a relatively brief but powerful introduction to Rep. Debra Lekanoff, who became the Washington's first Native American state representative after 40th-district constituents tapped her for the job last fall. The new lawmaker from Bow, a tiny community in Skagit County, is part of the most diverse Democratic majority in state history, and her story is a good one. Rep. Lillian Ortiz-Self is a school and mental health counselor, and she learns things about the lives of children every day that even their friends and family might not know. Today's "Capitol Ideas" is an eye-opener. As a school and mental health counselor, Rep. Lillian Ortiz-Self knows more about the dark side of childhood than most of us, but on that job and as a state lawmaker, she's in a unique position to understand problems, and to solve them. That's what today's "Capitol Ideas" is all about. Rep. Tana Senn has just been elected by her fellow legislators to chair the House Human Services and Early Learning Committee, and as you'll hear, it might just be a job she was destined for. Few lawmakers can match Representative Tana Senn's passion and effectiveness as a voice for children and families in the Legislature. Today we're talking about how and why she came by that distinction, and we'll get a glimpse of her goals for the 2019 session as the new chair of the House Human Services and Early Learning Committee. Rep. Mike Chapman dropped by today to talk about leading Washington's bipartisan, bicameral quest to make rural economic development a legislative success story. Rep. Mike Chapman represents one of Washington's most rural districts, and he's leading an effort to create good jobs and increase access to higher education in his and other districts from Seattle, Tacoma, and the other cities along the I-5 corridor who have prospered as the state recovers from the Great Recession. He talks about that effort today on "Capitol Ideas." Rep. Shelley Kloba makes a return visit to "Capitol Ideas" to talk about special education, cannabis, transportation, and more. This is Rep. Shelley Kloba's second visit to "Capitol Ideas." She's that good. Today she'll talk about easing Washington's transportation crisis, improving special education in our K-12 schools, fine-tuning the rules surrounding recreational cannabis, and perhaps most interesting of all, how and why she got into public service. Rep. Nicole Macri has devoted her life to, in her words, "ensuring that people have the opportunity to live in safe, healthy homes that they can afford." That's what we'll talk about in today's "Capitol Ideas." Outside the Legislature, Rep. Nicole Macri has devoted her career to, in her words, "ensuring that people have the opportunity to live in safe, healthy homes that they can afford." It's not surprising that she brought that focus to Olympia when she was elected in 2016. Nicole is back for a new session, and today she talks about how she'll be approaching the issue, and others, in 2019. State Rep. Gerry Pollet isn't shy about the need to upgrade special education in Washington's K-12 schools. In this fast-paced conversation he outlines the key problems and offers a set of legislative solutions. Speaker Pro Tem John Lovick drops by to talk about education, school safety, transportation, jobs . . . and working in the public sphere for nearly five decades, including two separate stints in the state House. We got to visit today with Rep. John Lovick, the 44th-district Democrat who serves as Speaker Pro Tem in the state House of Representatives. He was a state patrol office for more than 30 years, a state representative for nine, a county sheriff, a county executive, and then a state representative again. We talk about that and more in today's Capitol Ideas. Rep. Jeff Morris on Moore's Law and the Internet speeds you've always dreamed of (part two of two). Today’s guest is 40th-district State Representative Jeff Morris. In the conclusion of our two-part conversation, Jeff talks about some high-tech developments that have him interested, and how they're going to change life in Washington state. Rep. Jeff Morris on Moore's Law and the Internet speeds you've always dreamed of (part one of two). Today’s guest is 40th-district State Representative Jeff Morris. In this first of a two-part conversation, Jeff talks about some high-tech developments that have him interested, and how they're going to change life in Washington state. Today’s guest is 11th-district State Representative Zack Hudgins, and the topic is voting. More to the point, we’ll talk about plans that Zack and others have to make it easier for qualified voters to cast their votes, and to make sure those votes count. As chair of the House Committee on State Government, Elections, and Information Technology, he’s in a pretty good position to achieve those goals. Rep. Tina Orwall talks about how technology and science can help put rapists behind bars . . . if only we'll make use of them. DNA evidence gathered from victims of sexual assault can be law enforcement's most effective tool in identifying rapists, solving cold cases, and preventing future attacks. But when Washington state rep. Tina Orwall toured a police evidence locker several years ago, she saw untested kits gathering dust and stacked high on shelves. Her subsequent research led to a disturbing discovery: Washington alone had more than 6000 untested kits, and nationwide nearly half a million kits had never been tested. In today's Capitol Ideas podcast, she'll talk about her successful efforts to have those kits tested and the results used to ID rapists, and to prevent the situation from repeating itself. Rep. Christine Kilduff on the importance of civility, respect, and bipartisan cooperation and compromise in politics, and in life. Today's Capitol Ideas features a talk with Rep. Christine Kilduff about what she calls "the glue" that holds our society, and our legislative bodies, together: plain, civil behavior. It's an endangered species in today's Washington, D.C., but, with some notable exceptions, seems to be holding its own in Olympia. Rep. Monica Stonier works for the good people of Washington's 49th legislative district. A few years ago she was sent to Olympia by the 17th district, then took a two-year break. Today we talk about her experience as a two-time freshman. The last time she was featured on Capitol Ideas, today's lawmaker was Representative Monica Stonier of the 17th legislative district. That was almost three years ago. Since then Monica lost her reelection bid, moved into the 49th, and resumed her public-education career as a middle-school instructional coach. Two years go by. A seat unexpectedly opens up for a 49th-district rep, Monica goes for it . . . and here we are, about to review her second time around as a freshman lawmaker. Rep. Sharon Wylie talks about the efforts to replace the aging bridge on I-5 connecting Washington with Oregon. This story started a long time ago, and it's looking like the end might possibly be coming into sight. The I-5 bridge spanning the Columbia River between Vancouver and Portland turned 100 years old this past Valentine's Day. Efforts to agree on and pay for a replacement have been going on for years, but as Washington state Representative Sharon Wylie explains, it's complicated. In this edition of "Capitol Ideas," she traces the past and points toward a promising future. Today we look at a pair of bills sponsored by Rep. Noel Frame (D-Seattle). One would shortcut the currently cumbersome route college students with disabilities have to take when transferring between schools. The other looks at a high-tech alternative to college textbooks that can cost hundreds of dollars for a single course. Rep. Frame is joined by Washington Student Association members Anna Nepomuceno (UW-Tacoma) and Maresa Miranda (WSU-Vancouver). Washington state pumps about 95 million metric tons of carbon dioxide into the atmosphere every year. That's more than twice the targeted volume for the year 2050, and we're behind schedule to meet that goal. Burien Democrat Joe Fitzgibbon chairs the House Environment Committee in Olympia, and he's introduced a bill to speed up the process by taxing carbon polluters at a rate of $15 a ton. We'll talk about his bill, and why it matters, in this edition of "Capitol Ideas." Violence against Muslims, Jews and people of color continues to increase, and one conversation about it doesn't seem to be enough. This week Rep. Derek Stanford and Aneelah Afzali, director of the American Muslim Empowerment Network, pick up where the last "Capitol Ideas" left off. Overt acts of anti-Semitism are increasingly common around the U.S. and here in Washington state. Mosques are burned and vandalized. People who look vaguely Middle Eastern are targeted by violent xenophobes, and racist bullies do what racist bullies do. Is hate the new black? We hear today from a lawmaker and a rabbi to get their take on increasing threats to America's sustaining values, and what they're doing about it. A Democrat and a Republican walk into the state House of Representatives . . . and work together on bipartisan legislation to reform the Public Records Act. This is no joke. Rep. Joan McBride, Democrat from Kirkland, has worked with GOP Rep. Terry Nealey (Dayton) since last year on an effort to bring Washington's Public Records Act into the 21st century. In this bipartisan Capitol Ideas conversation, they talk about how they managed to craft bills that so far have the support of stakeholders on all sides of the issue. State Rep. Kristine Reeves talks about veterans' issues, jobs, foster care, veterans' issues, the American Dream, her first speech as a legislator, jobs and economic development, having a twin, and veterans' issues. Rep. Kristine Reeves works for, as she says, "the 137,000 people of the 30th district." That’s mostly south King County with a little bit of Pierce, and it includes Federal Way, Des Moines, Milton, Algona and Pacific and part of Auburn. She was sworn in as a brand new lawmaker on January 9, 2017. State Rep. Brian Blake on fishing, forestry, jobs, and why he's unhappy with the EPA. Rep. Brian Blake works for the people of the 19th legislative district in southwest Washington. It’s a place where people fish not just for fun, but for a living, where the timber industry has employed generations of tough men and women, and where agriculture thrives. A former logger himself, Brian lives in Aberdeen, and in the Legislature he chairs the House Committee on Agriculture and Natural Resources. State Rep. Zack Hudgins goes deep on cybersecurity in the latest "Capitol Ideas." Today we’re going to hear Representative Zack Hudgins talk mostly about an issue that’s on a lot of minds lately: cybersecurity. Zack has a professional background in the tech industry, and long before the word “hack” entered the average person’s vocabulary, he was looking at ways to keep online data safe and private. House Majority Leader Pat Sullivan takes a quick look at Washington's public schools. House Majority Leader Pat Sullivan (D-Covington) might be the most dedicated advocate for public schools in Olympia, and he's a leader on the state’s education-funding task force. But like every lawmaker, he’s also answerable to the constituents in his home district. In this case, that’s the 47th, and in today’s brief conversation he touches on both of these roles. Rep. Roger Goodman: Working across the aisle. Rep. Christine Kilduff, a fighter for veterans, the disabled, and Washington students. Rep. Christine Kilduff, D-University Place. Rep. Laurie Jinkins talks about transgender rights. Rep. Tana Senn, D-Mercer Island). Learning the Ropes: Rep. Monica Stonier returns to Capitol Ideas to talk about moving from the classroom to the Capitol. Rep. Monica Stonier (D-Vancouver) talked with Capitol Ideas a few days before being sworn in as a brand-new state lawmaker, after more than a decade as a classroom teacher and teaching coach. What was that transition like, and what did she learn in her first two years? Listen in and find out. House Majority Leader Pat Sullivan assesses 2014 Legislature as it nears the session's midpoint. House Majority Leader Pat Sullivan (D-Covington) talks about House Democratic priorities, what's passed, and what hasn't, as the clock ticks down on the first half of the 2014 session. Rep. Laurie Jinkins (D-Tacoma) talks about the fight to ensure that reproductive parity continues to be a Washington tradition. Rep. Zack Hudgins (D-Tukwila) explains the Washington State DREAM Act. By most any measure, the House Appropriations Committee is one of the plum assignments, and one of the key decision-making groups, in the Washington State Legislature. Rep. Timm Ormsby is vice chair of the committee, and today he reflects on just what that means. We have a return visit today with state Representative Eric Pettigrew. Eric represents Washington’s 37th legislative district, which follows the southwestern shoreline of Lake Washington from south Seattle’s Capitol Hill down to Renton. The last time he was on “Capitol Ideas,” in the summer of 2010, Eric was chair of the House Health and Human Services Committee. His resume and job description have changed significantly since then, and that’s where we’ll start today. Our guest today is state Representative Tina Orwall. Tina represents Washington’s 33rd legislative district, a South King County district that includes Sea-Tac, Des Moines, Normandy Park and large parts of both Burien and Kent. Before running for office in 2008, Tina focused her energy on strategic planning in health care and workforce development, affordable-housing efforts, advocacy for military veterans, developing public-private partnerships. In Olympia, she serves as assistant speaker pro tem of the House of Representatives, presiding over much of the floor action in that chamber. As a member of House leadership she’s got a seat on the Rules Committee, which decides which bills will make it to the House floor, and her policy committees include Early Learning and Human Services, Education Appropriations and Oversight, and Judiciary. And to make sure she doesn’t find herself with any spare time, she co-chairs the Joint Committee on Veterans’ and Military Affairs. If you’ve listened to Capitol Ideas for a while, you may remember Tina’s first visit in the summer of 2010. Our guest today is state Representative Laurie Jinkins. Laurie represents Washington’s 27th legislative district, a vaguely mushroom-shaped piece of northern Pierce County that includes most of Tacoma and all of Ruston, and stretches from Fife in the east to Highway 16 in the west. Representative Jinkins is midway through her first two-year term in the House. Before running for office in 2010, Laurie was – and still is -- deputy director of the Tacoma-Pierce County Health Department, managing its daily operations. She’s served as Washington state’s assistant secretary of health, and as a young law-school graduate she worked as assistant state attorney general in Tacoma. She’s also a board member, director or member of far too many civic organizations to mention. In Olympia, Laurie is vice chair of the House Healthcare and Wellness Committee, and sits on the transportation, capital budget and environment committees as well. Welcome to the first Capitol Ideas podcast of 2011. It’s a new year, a new session, and we’re speaking today with a new member of the Legislature, Washington state Representative Cindy Ryu. Cindy was elected in November to represent the state’s 32nd legislative district, a north King and south Snohomish county district that stretches from Edmonds in the northwest all the way down to Kirkland in the southeast. In between, the district includes Lake Forest Park, Kenmore, and Shoreline, Cindy’s home. Representative Ryu is new to the statehouse, but this isn’t her first taste of public service. She’s a former president of the Shoreline Chamber of Commerce, and served on that city’s city council for two years before her election as mayor in 2008. Two months ago she became the first Korean-American woman elected to serve in the state House of Representatives. We’re speaking today with state Representative Sherry Appleton. Sherry represents Washington’s 23rd legislative district, which comprises the bulk of Kitsap County, including Poulsbo, where she lives, as well as Bainbridge Island, Silverdale, Kingston and East Bremerton. She was elected to the Washington State House of Representatives in 2004 and is currently vice-chair of the House State Government and Tribal Affairs Committee, and is a member of the House Public Safety and Emergency Preparedness, and Health Care and Human Services Appropriations committees. We’re speaking today with state Representative Mike Sells. Mike represents Washington’s 38th legislative district, a fast-growing Snohomish County district that includes Everett, Marysville and Tulalip. Mike is vice chair of the House Higher Education, and he’s also a member of the Transportation and General Government Appropriations committees. We spoke recently in his Everett office. State Rep. Tina Orwall represents Washington's 33rd Legislative District, including the communities of Des Moines, SeaTac, and Normandy Park, as well as parts of Burien and the west half of the city of Kent. The Democratic freshman serves as vice chair of the House Human Services Committee and is a member of the chamber’s education and capital-budget panels as well. Seattle State Rep. Eric Pettigrew is an eight-year veteran lawmaker representing Washington's 37th legislative district. It's a distinctly urban district and one of the state's most diverse, stretching from Seattle's busy waterfront seaport east to the shores of Lake Washington, and south to Renton, comprising nearly a dozen separate neighborhoods (Rainier Valley, Madrona, North Beacon Hill, Rainier Beach, Mt. Baker, Leschi, Columbia City, southern Capitol Hill, Skyway and Hillman City). Zack Hudgins of Tukwila represents Washington's 11th legislative district. 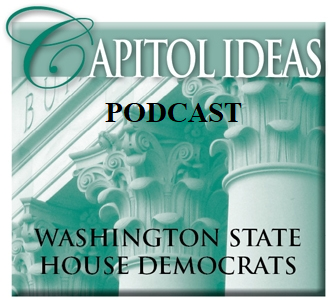 He's floor leader for the majority Democrats in the Washington State House of Representatives, and in today's "Capitol Ideas," he reviews the 2010 session, looks forward to 2011, and talks about the diverse district he serves. One of the most pressing, most expensive, and most controversial projects in Washington state today is the proposed replacement of the State Route 520 floating bridge that spans Lake Washington. It’s a bridge that’s used by more than 150,000 people every day, connecting the city of Seattle with Kirkland, Bellevue, Redmond and other cities on the east side of the lake. Replacing the bridge will be a massive project, and as a lawmaker whose district includes the eastern terminus of the bridge, Rep. Larry Springer is a key member of the Legislature’s 520 Work Group. That’s what we’re going to talk about today. Rep. Timm Ormsby (D-Spokane) and Legislative Assistant Shannon Waechter give a behind-the-scenes look at how a legislative office works.